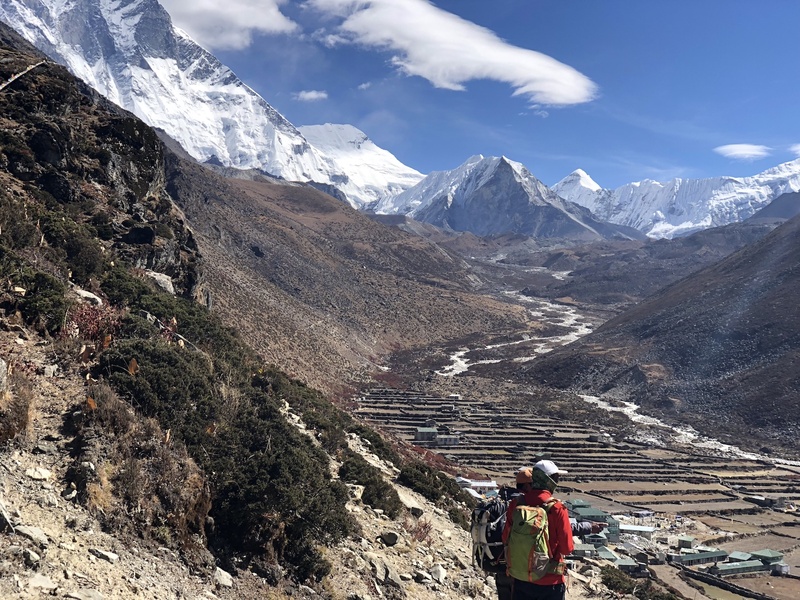 Everest 2019: Trek to Tengboche Monastery Everest 2019: When is a Rest day, a Rest Day? The migration continues, slow and steady in the Khumbu. The Everest-Tibet teams are starting to arrive in Kathmandu. Some will trek for acclimatization before moving over to the Tibet side while others will go directly to Lhasa and drive to Base Camp-Tibet. Traffic is picking up on the trail to Everest Base Camp – Nepal as more teams are flying into Lukla. Weather looks to be moving into Nepal over the weekend, and could make the trek a bit uncomfortable and snow at EBC – Nepal. Yesterday we saw Adventure Consultants take a helicopter from Kathmandu to Lukla due to the construction at Kathmandu and the restrictions on fixed winged flights. Today we saw Madison Mountaineering take the drive to Ramechhap for their flight to Lukla. This added a few hours to their day but they arrived on time. This is Garrett calling in for the Mount Everest expedition. Today is April 4th and we have arrived in Lukla, Nepal (2850m) in the Khumbu Valley! This morning we flew from Ramechhap, near Kathmandu, to Lukla and landed about 6:30 AM. But the usual weather patterns are making for delays in and out of Lukla. Kirstie Ennis reported they got into Lukla by helicopter. But one issue is that choppers can’t carry all the gear so they come on the next flight, or the next, or the next … anyway, they now will overnight in Lukla waiting for their bags. Now on to what they are experiencing on the trek. Today, our trekkers will experience some meaningful moments for most and for all they will leave the forest for the high tundra of the Himalaya. For me one of the most meaningful experiences of climbing in Nepal and Tibet, or anywhere with Sherpas, are the ceremonies. 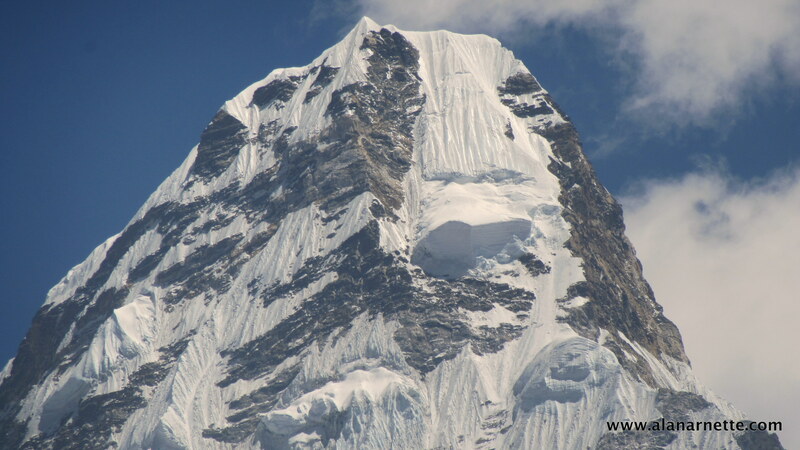 There are multiple blessings, prayers and Pujas before one climbs a peak, especially one like Chomolungma aka Sagarmatha. 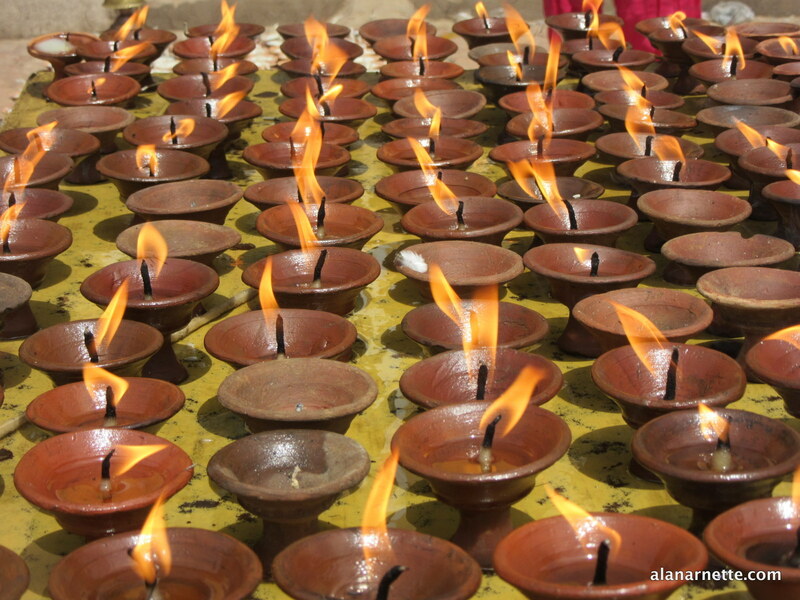 Commonly called a Puja at Base Camp but there are others along the way. All of the ceremonies pray to the mountain Gods for permission to climb, forgiveness for damaging the mountain, and safety for all those climbing. 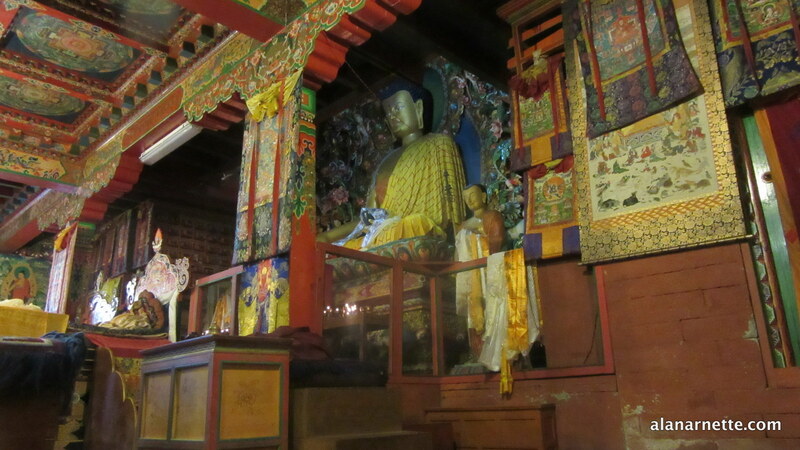 However, you can experience the serenity and inspiration of Buddhism through a quiet moment sitting still in a Monastery. You spent a nice night in the Rivendell Lodge just downhill from the Tengboche Monastery. The Rivendell is one of the newer and more comfortable teahouses on the trek. Some rooms have private toilets. And the dinning hall is open and accessible. However, it’s the view that leaves an impression. You went to bed early last night, around 8 as others stayed up playing cards or watching a movie on their phones after recharging it from the solar panels for 500 Rupees. It was cold again, both inside and out but you were comfortable and now rested as the morning sun broke through your weak curtains. Time to get up. You objected at first but then leaned over on your right elbow and pulled the sad curtain aside. The window was covered in condensation. You wiped it off. And then you understood. The view was obstructed as it usually is in the Khumbu from late afternoon into the evening so you were told of the view, but never saw it. Now there it was – Ama Dabalm up close and personal. Oh my, what a view! Even though you have been seeing its pointy peak for the last several days, from this vantage point you could inspect every couloir, every crack, and the Dablam itself. The sun was rising quickly and you wanted to get THAT picture to show everyone back home. Up and on with your trekking clothes, down jacket included and out the door. But the sun was now over the summit and into your face. You would have to settle for a memory, a memory that you would never forget. You rush to get breakfast and then quickly went back to the Tengboche Monastery. Your goal is to observe the morning prayers by the Monks. You hustled up the stone steps, completely out of breath because you had to hike up a dirt gulley that seemed much steeper going up than it was going down the last time. There were a few other fellow observers gathered outside the huge wooden door. You take off your shoes and put them neatly aside all the others. It was quiet for a few moments and them a young Monk came along. At first he seemed sullen, and then you realized he was basically still asleep. He opened the door and quietly welcomed you into the Monastery. Your first sight was the largest Buddha you had ever seen, maybe 10 meters higher – that’s over 30 feet. It was huge and golden. The statue had a peaceful look in his eyes. The visitors sat on Tibetan rugs to the right of the main area. It was cold. You could see your breath. You pulled your down jacket tighter, your cap over your ears and then you tugged on your gloves. Your sock feet were cold. Now you understood the heavy crimson robes. One by one the Monks entered the main hall. It appeared each one had their place – seated by seniority or position. Nonetheless, everyone entered in a kind of ruppeled fashion and settled onto their pillowed seat – crossed legged, with the crimson robe covering almost all of their body except for their head. Soon, two young Monks, perhaps 10, 14, or 16 years-old began to serve hot tea to their elders. It was a purposeful moment but not overly formal. One of the Monks sneezed. No one offering a Gesundheit, or even a Buddha Bless You. Without a cue the drum beat began and one of the senior Monk began his chant – actually a prayer. Others joined in. They created an unbelievable resonance that built as it bounced off the artfully painted walls. You close your eyes to take this moment in without the filter of sight. This is spiritual and sensory. This is one of the moments, one of these sounds that will echo within you throughout your life. Leaving the Monastery, you hurry back to the teahouse just as your team is leaving. The snow last night has turned the landscape into a wonderland. The white snow on the green pine tress provides a contrast of life and cultures that you felt as you left the Monastery. 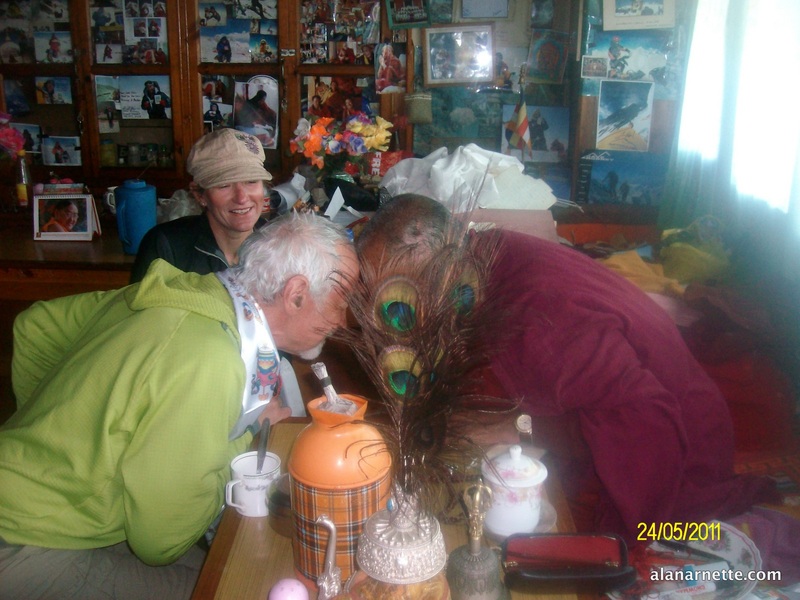 For many who have climbed in the Himalaya, one of the highlights is receiving blessing from Lama Geshe. Sadly, he passed away in February 2018. Today, Lama Nawang Paljor performs the blessing at the Pangboche Monastery. Lama Geshe used to do it in his home along with his wife and sometimes daughter. He was special to me as I had my first blessing from him in 1997 and many until his passing. If you did not know Lama Geshe then this is what made him so special – his smile, his gentle touch, his soft laugh, his aura that made you feel as if the world was in good hands. His hands were always warm no matter how cold the room was. You simply felt better, no matter your woes, by just being near him. We had a blessing with him before my 2001 Everest summit and Mirjam (my summit partner) I made a point to return afterwards to thank him. He was deeply touched and said rarely does anyone visit him after a climb. It is quite a ceremony for the blessing and was common to have to wait for an hour or more if he was currently blessing another team. You wait outside in the small grass yard, surrounded by a stone wall. Perhaps a yak walks by, bells clanging in the background along with the soft flutter of prayer flags overhead. If his daughter was home, she served as organizer ushering people out and then the next team in. His wife served hot tea or coffee-milk along with simple biscuits on a metal tray. 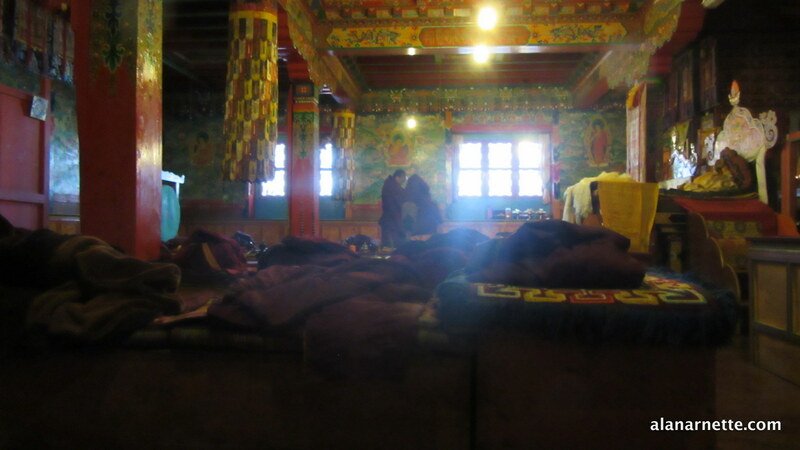 It was a large room in his home by Sherpa standards with benches lined up against the walls. Lama Geshe sat behind a small desk, his back to a wall of windows, Ama Dablam in full glory, allowing the sun to shine directly into the otherwise dark room. Usually one of the senior Sherpas, often a monk himself, would take the lead and introduce the team and what mountain they were climbing. The Sherpas knew Lama Geshe well and revered his blessing. The puja began with the Lama quietly praying – a soft chant born hundreds of years earlier high on the Tibetan Steps. He used a bird feather to wave at the smoke rising from a single piece of incense. He spread water droplets from time to time and rang a bell. All of this had meanings deeply rooted in the Buddhist culture. As guests, we would sit quietly. Some would go deeply into their own mind, others would hang on each sound and movement that were both entertaining and perplexing by what the old Lama was doing. The Sherpas would sit quietly, hands in lap. But pictures were allowed and the quiet was often interrupted by the sound of a shutter. Lama Geshe often looked over and just smiled. He understood the modern world. One by one the guests were called up to sit in a chair before the Lama. First he took a thin yellow or red string (a sungdi) and tied it around your neck. Then you gave him a silk scarf (a kata) to his daughter with an offering in it, maybe 100 Rupees. He would say a brief prayer and then the scarf was placed back around your neck. For many, he offered a gentle head bump to “seal the deal” while holding your hands, palms up. You then moved back to the bench and sat quietly while he did the same ceremony with all the other climbers and Sherpa. Throughout the entire blessing, he would look you straight in the eye. The meaning was clear. I was always touched by this ceremony. In the quiet moments, I reflected on why I was there and what this moment and experience meant to me. I still do today. Some people walk away with tears in their eyes, others with huge smiles and some with no expression at all, struggling to understand. I miss Lama Geshe. There will be one more Puja at Base Camp before you start to climb and that is the most meaningful for many people. 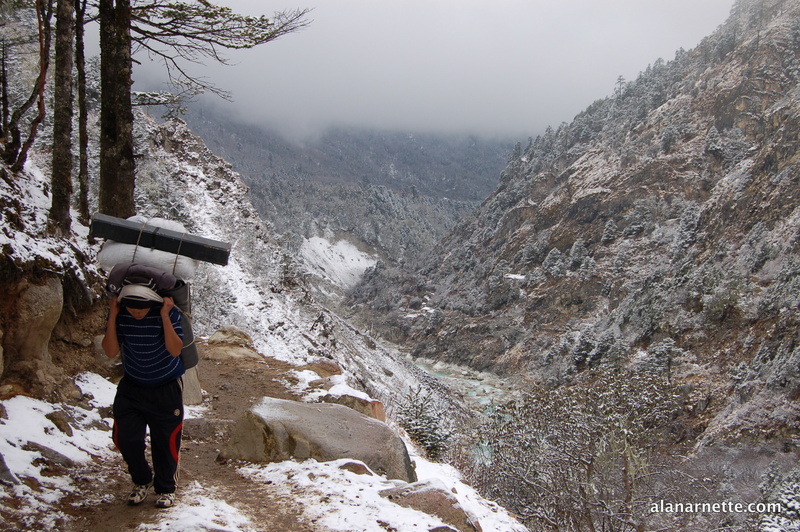 Leaving Pangboche, the trail continues to gain elevation. You left the trees a little while ago and now are trekking fully exposed to the elements. The wind picks up on an open flat area. You are glad for all your layers and add your Buff to help cope with the cold, dry air. You continue to follow the Dudhi Kosi and cross it as you takes the right path of a huge ridge that seems to divide east from what, or maybe north from south. At this point , all you know is to follow the path. Arriving into Dingboche, you find a more primitive and remote village. Off in the distance you can see the back side of Lhotse and also the front of Island Peak. You were spoiled by Namche but understand the higher villages are really respites for summer yak herders and seasonal trekkers and climbers. No matter, you are grateful when your guide announce you have arrived at your lodge for the evening, and that they have WiFi! You are both correct. Sergi Mingote climbed K2, Broadpeak and Manaslu last summer. He plans to climb Everest, Lhotse and Kanchenjunga this Spring. If he does smmit he will beat the current record holder, Silvio Mondinelli, who climbed the three highest mountains in 3 years and 64 days. Neither of these records will hold if Nims Ourja succeeds in his goal of summiting all 14 of the 8000ers in seven months. Thank you Alan for telling us about these ambitious climbers. I will be watching from my “armchair”. sera au Népal dans quelques jours pour la suite de son projet 3x2x8000 : au programme #Everest, #Lhotse et #Kangchenjunga ! Ces derniers mois il a déjà gravi #K2, Broadpeak et Manaslu! Yes ! agree with you Royer ! What about his plan for G1 and G2 ? Did you find any source ?